We are delighted that Ruth Reichl will be our Summit Keynote Speaker this year. Writer/editor/food critic and cook, Ruth was at the forefront of the food revolution in the early 1970s that has led us to our awareness and love of good food today. We all may know her as the Editor in Chief of Gourmet Magazine, but her career as a writer began in 1972 when she wrote her first book, “Mmmmm: A Feastiary,” followed by her involvement as cook and co-owner of the collective restaurant, The Swallow, from 1974 to 1977. In the 1980s she was the restaurant critic and food editor for the Los Angeles Times and in the 1990s she changed jobs – and coasts – when she was hired as the food critic for the New York Times. In addition to the articles she wrote for both papers, she has written five books, including her humorous “Garlic and Sapphires” which recounts her life in disguise as a food critic in New York, along with her other memoirs Tender at the Bone and For You Mom, Finally, (originally published as Not Becoming My Mother and Other Things She Taught Me Along the Way). 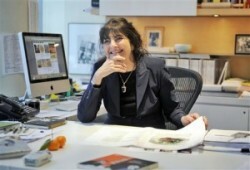 In addition, she has published 10 books as editor of The Modern Library Food Series. 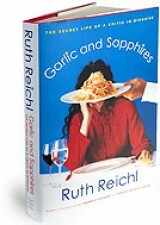 Ruth’s words appear not only in print, but online with her current stint as Editorial Advisor for Gilt Taste, a publication that promotes food artisans and producers as well as her own blog, ruthreichl.com; she also produced and appeared on public television with her series “Gourmet’s Adventures with Ruth” and “Gourmet’s Diary of a Foodie” as well hosted three specials for the Food Network. Ruth is the executive producer of Garlic and Sapphires, a Fox 2000 film based on her memoirs to be produced by Cary Brokaw’s Avenue Pictures. Not to leave any media untouched, she is a regular host with Leonard Lopate for a live monthly food show on WNYC radio in New York. Among her many accolades, Ruth has received six James Beard Awards for her work in food writing, journalism and restaurant criticism. As you might imagine, Ruth is in demand as a speaker – her engagements find her in London, Paris, New York as well as other cities around the country. Her lecture “Why Food Matters,” delivered in October 2005, was published in The Tanner Lectures on Human Values, Volume 27, in 2006. In March 2007, she delivered the J. Edward Farnum Lecture at Princeton University. With her breadth of knowledge and passion for food, we can’t wait to hear what Ruth has to say when she helps us kick off our Summit in the fall!